National Geographic is going commercial, partnering with 21st Century Fox to create a new for-profit venture: National Geographic Partners (NGP). NGP will gather under a single umbrella not just the magazine, but also the cable TV channels, studios, maps, digital media, and pretty much everything else associated with the venerable brand. At least the National Geographic Society will remain firmly in the non-profit sector (for now). I suppose we can’t be too surprised by this turn of events. After all, NatGeo has been in bed with Murdoch for nearly 20 years via its cable TV channels. It makes good business sense to consolidate the organization’s scattered endeavors into a single, well-integrated entity across multiple platforms. And I get why the folks at NatGeo might be eager for an infusion of cash — about $725 million, pushing the total endowment to just a tad over $1 billion. They’re feeling the pressure of the digital revolution just like every other media outlet, and scrambling to survive (and hopefully prosper). The magazine still boasts a healthy 3.5 million-plus readers, but that’s a steep decline from its heyday, when its circulation was around 10 million. What does Murdoch get for his $725 million? Under the terms of the deal, Fox owns 73% of the fledgling NPG, with the National Geographic Society controlling 27%. That’s.... a little worrying, despite the fact that each partner will have equal representation on the board and governance will be shared equally between them. Climate change has been going on as long as the planet is here… How much of it are we doing, with emissions and so on? As far as Australia goes? Nothing in the overall picture. Naturally there is some concern that Murdoch and his minions might be tempted to put pressure on the magazine regarding its editorial coverage, particularly on politically controversial issues like climate change. On that score, National Geographic editor-in-chief Susan Goldberg is toeing the party line, at least in her public statements. She says she thinks the deal will be “great for the magazine” and insists she’s been assured that 21st Century Fox will not interfere with the magazine’s content. Fox CEO James Murdoch and National Geographic Society chief executive Gary Knell both echoed that sentiment, swearing that there had never been interference with the content of the TV channels and the same would be true of the magazine. Seriously, just Google “Fox News anti-science” and you’ll get an abundance of examples of anti-science and pseudoscientific rhetoric. I find it hard to believe this is not due at least in part to Murdoch’s pernicious influence, as that culture has been fostered over the years. “But that’s Fox News!” I can hear the defenders cry. “This is something totally separate!” (Quartz points out that James Murdoch has solid environmentalist bona fides. Plus he drives a Prius!) Yeah, maybe. It’s still not hard to imagine how a polite hint here, and a minor suggestion there, could send NatGeo down the same path over time — especially since Murdoch ultimately controls the purse strings with his 73% stake in the new joint venture. Certainly, we’re unlikely to see another issue like the “war on science” one, from March of this year. Over the past decade, an amoral cynicism has taken hold on many non-fiction cable channels that built their brands as educational. This has led to programs that are so misleading they often undermine educational goals. These programs are now directed at young adults but will be seen and absorbed by children. National Geographic is the ultimate symbol of this, because its standards were so high. Granted, this unfortunate trend isn’t limited to the Murdoch media empire, but this is what someone from inside the fold, so to speak, had to say about the NatGeo channels in particular, just two years ago. 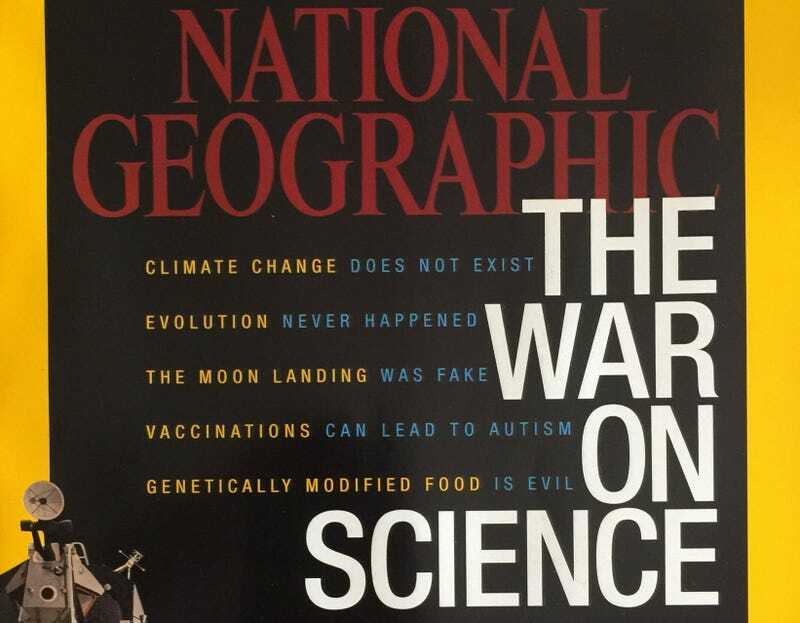 It must be baldly stated: The National Geographic Society, through several channels that are now its primary voice, is using its once-honourable name to produce misleading shows that can cause harm to children. I wonder what Parfit will make of this new deal. There’s a place for profit, but there’s also a place for philanthropy. Now more than ever, we need at least some media outlets that are not heavily reliant on commercial interests with their own political agendas — especially when it comes to science.